We have lived together on our block since mid-2004, but my partner bought it in early 2003. The original garden was a tip, courtesy of the previous owners leaving piles of rubbish and other junk items behind. As if that wasn't bad enough, they had decimated all the trees on the place, black-plastic'd the garden beds and left some terrible, unattractive and sickly shrubs as the legacy of their occupation and neglect over several years. I took one look and after the initial horror subsided, I knew instantly how to transform it. Over the space of a few years, we cleared the junk, removed the remaining shrubs and tree stumps, began building vegie beds then set up the native bed and the orchard bed. The trees were planted over Winter and Spring in 2007 and despite some setbacks have been doing very well ever since. Set on a mostly sunny block, in the foothills of the Dandenong Ranges, we have a long orchard bed that faces north east along a fence, before turning towards the east for a short distance, forming an "elbow". Most of the long portion of the bed holds our deciduous fruit trees, while the "elbow" and the top end of the long bed has our citrus trees. The orchard beds are raised, about one foot off the ground, and edged with ironbark sleepers. They were originally lined with newspaper then topped with lucerne, chook poo and mushroom compost. Over the following years, the materials broke down, so additional mushoom compost and vegetable compost has been added to keep the level up. The subsoil is heavy clay with a thin layer of good fertile soil on top. Drainage is poor, hence the raised beds, and prone to waterlogging in heavy rain. We get a lot of run off from the large hill to our west, only worsening the already inadequate drainage. 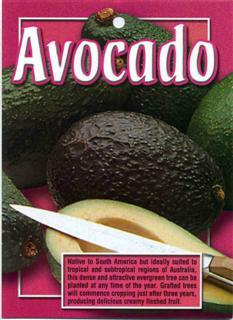 Rainfall is generally moderate to good, but the drought has taken its toll in 2008 and early 2009, so some fruit drop was experienced, especially from the avocado, citrus and kiwifruit. The extreme heat in January 2009 resulted in scorching of the avocado and kiwifruit and my roses, but o/w everything coped remarkably well. Our trees have been selected for their ability to tolerate, or a need for, cold to frosty conditions over winter. Any frosts we have are generally light to moderate, but we have had heavier frosts and one as late as November in 2007 was bad, temporarily damaging some of our young trees and decimating some of our vegetables. We plan to further extend the orchard towards the north, but that plot needs to be extensively re-worked before that can happen. 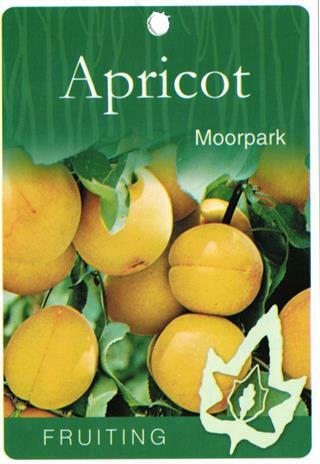 A wish list of trees for the site includes a peach, a nectarine, a white sapote "Lemon Gold", a double-grafted blood plum, another olive, another fig and perhaps a medlar or a mulberry, if there's enough room or dwarf varieties are available to let the sun through to the citrus trees. The vegetable and herb garden is set up in the south-east of the block, which mostly gets full sun from morning to evening. It contains two berries, a marionberry and a loganberry, rhubarb, strawberries, "dry sunny" herbs, "moist shady" herbs, and several beds for rotating a variety of crops over the year. More beds will be added to this to grow asparagus, raspberries and a bigger range of vegetables. Like the orchard, it is raised, but two sleepers high, for ease of managing, and was filled with the newspaper, lucerne, chook poo and mushroom compost technique, and also topped up with more mushroom compost and home produced compost over time. The orchard bed also has several lavender plants and bulbs planted, which provide Winter and early Spring colour when the trees are bare, and some annuals are grown to hide the bulb leaves as they die down. Birds, like us, love the fruit we've produced so far, especially the apples and figs, so we acquired two very long pieces of netting, lashed them together to make one long and wide piece, and have set up narrow PVC piping columns and arches to drape the netting over the trees, all of which are kept to a maximum of 2.5m. The beds are watered by rain, tank water via sub-soil drippers and by mains water in hot dry weather, on days when watering is allowed. Our biggest challenges have been the drought, the resultant water restrictions and the set up costs. We've spent several thousand dollars on timber, mushroom compost, watering systems and tanks, plants, netting and assorted materials, but it is worth it to see the garden grow and produce such wonderful food and greenery. Once the trees are fully productive, they will have repaid us many times over in fruit and pleasure and they will also have saved us from chemical poisoning, produced plenty of oxygen and absorbed loads of carbon from the atmosphere. Some moderate hassles have been encountered in dealing with nurseries when trying to obtain the plants we want and finding out what varieties they have available or can get in for us. A lack of information, poor service, diseased/pest affected/otherwise unhealthy plants and high prices have all been encountered, but thankfully we have acquired a very good selection of plants at a reasonable price. The birds and the occasional hassle with pear and cherry slug are a minor nuisance which are easily managed by netting, persistance and pyrethrum spray or squashing. The highest rewards have been eating our own produce - the flavour, the colour, the freshness and the immediacy of it makes all the hard work and expense completely worthwhile. Having the pleasure of looking out to our trees all year round, from bare-branched Winter to soft green and flowery in Spring, darker green and swelling Summer and the colours of Autumn, and knowing we have created such a wonderful little paradise is nothing short of heaven. 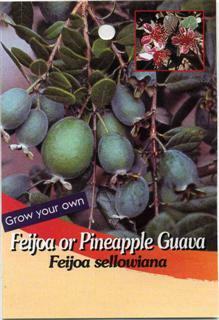 A deciduous, hairless kiwifruit, that is self-fertile. It requires protection from strong afternoon sun, preferring morning sun, so we have it planted towards the shady side of our Avocado. It copped a scorching in the extreme heat of early 2009, which forced it to drop its first crop, and some leads withered, but after a heavy pruning in winter 2009 it is now growing vigorusly again, covered in young leaves. Hopefully this year will see its first crop survive for eating; stand by for a review of the fruit! I presume it is sourced from a cutting. Extreme heat - shade in the afternoon essential in those conditions. A very recent acquisition, in late summer 2008/2009, it quickly had to adjust to being protected from the cold of winter. Currently, it is sheltered in a basket on a wall by the back door, where it receives filtered light in the morning and late afternoon. Once the night temperatures stay above damn near freezing, it will be moved to a much sunnier, warmer wall for the rest of Spring and the Summer and Autumn, before being brought back into a protected zone for Winter. With Spring coming along nicely now (mid-September, 2009) it is showing signs of putting on growth. This variety is far more cold tolerant than it's red cousin (which I adore), but there is no point in trying to teach it to love frost. 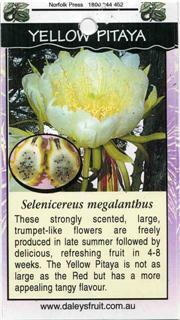 The stem is fleshy, a little prickly and roughly triangular with crests. It can be propagated by cuttings, which like most succulents have to be left to dry and form a callous before they can be planted out. If it likes the conditions here, I look forward to our own dragon fruit in the next year or two. 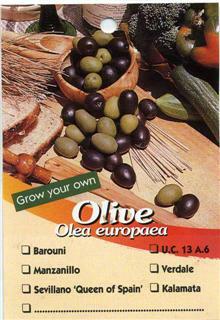 No flowers yet, but still early days for an olive. Easy to maintain, it has a lovely upright habit which has naturally formed a vase-shape. It grows moderately each year, approximately a foot or so each Spring and Summer, and it copes with all the vagaries of wind, sun, cold, heat, drought & wet that it faces in its pot by the citrus tree bed. When we've set up the 3rd orchard bed, it will be planted out to provide some protection to the house from the afternoon summer sun. The fruit can be harvested when green or black (I prefer black olives), and are better suited to pickling and eating that oil production. If we have the space for a second olive tree, I will get one that is better for oil production, so we can have the best of both worlds. Double-grafted with a Williams pear. They haven't flowered up till now, but the fruit spurs have developed nicely and they should be flowering this Spring. Easy to care for, provided you keep the pear and cherry slug at bay [see pest Control, below]. Pear and cherry slug - as per Stella Cherry - pyrethrum spray and squashing when larvae noticed, and it was sprayed with lime sulphur this winter (2009) to try to cut them off at the pass. Similar in habit to the Granny Smith, above, it too is kept to about 2.5m in height for manageable harvesting and netting. Like the Granny Smith it is very hardy, prolific and vigorous. 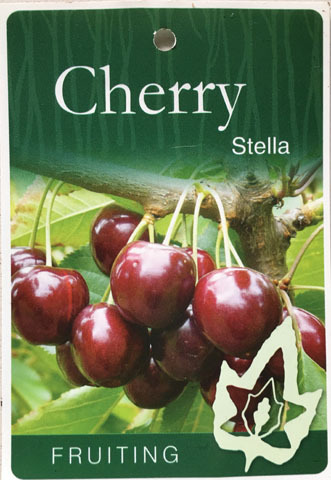 It produces red, cream and green flecked and striped fruit which is very sweet and crisp. Lovely for lunchboxes and desserts. Not troubled by pests, thankfully. Kept netted to keep the birds from the fruit, but o/w does not require any special treatment. Kept to 2.5 metres high by summer & winter pruning, if it is a dwarf it's the tallest in the world! A lovely, hardy, prolific tree, it produced a fabulous crop two years after it was planted. It grows vigorously in Spring and Summer, so we keep it pruned to a manageable 2 metres or so to enable us to reach the fruit and haul the netting over it. The apples, bred in Australia in the 1800s, are perfect for cooking (they make the very best apple pies, apple sauce, jams and jellies), baking, treating diarrhoea (grate the fruit, skin and all and eat it - the pectin sets both jam and poo!) or eating fresh. Tart and sweet at the same time they are very refreshing and make the mouth tingle with pleasure. No pests noted so far, touchwood. I bought this lovely tree in a small pot back in 2002 or thereabouts, but it didn't get enough sun to prompt sufficient growth, flowering or fruit set for at least two years. When I moved to a much larger and fully sunny block in 2004, it got a new lease on life and put on some growth and finally flowered. No fruit set, but at least it was much happier. Once we planted it into the orchard bed we set up in 2007, it took off. It flowered well in 2007 and managed to provide about half a dozen apples. 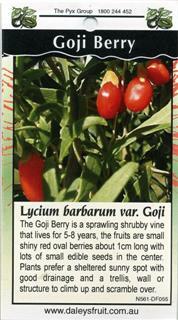 It produced a fabulous crop in 2008/2009, more than 20, remarkable for its small size. It is only 1.5m high and about 40cm wide, but it is covered with fruit spurs. Now that Spring (2009) is under way, it is once again showing signs of flowering prolifically and should provide a substantial crop. 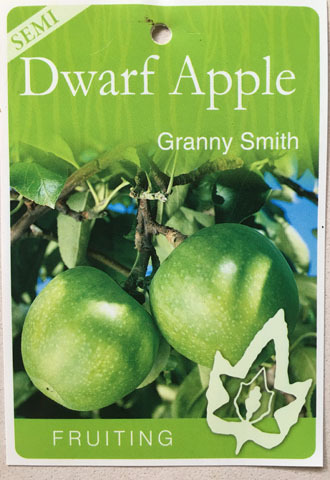 The apples can be eaten green or cooked, as per a Granny Smith, or if you can wait till the apples have red and white flecked/striped colour, it is sweeter, like a Jonathan. No pruning required at all. Lots of growth, with a lovely white-spotted dark brown trunk and large pendulous leaves. No flowers yet, but plenty of spurs now present and signs that it might flower this year (2009). This has been the odd one out in the orchard bed, not yet having produced any fruit, hardly flowering and not putting out much growth except atthe tope (where we don't want it), so it has very few branches. It is pruned each winter, fed, watered, receives the same high levels of cold in winter and sun as all the other (successful) deciduous and evergreen trees, but is the only one to be a dud. If the damn thing doesn't produce the goods this year it will be pulled out and replaced. Pear and cherry slug - sprayed with pyrethrum each fortnight when larvae are noticed, and the good old squash technique is also employed. Sprayed with lime sulphur this (2009) winter to try to deter them reaching the leaves this year. Any suggestions on why the damn thing isn't growing vigorously lower down, and how I can remedy this? A tiny shrub with very small leaves and an upright habit, it produces the tiniest berries imaginable - about 5mm across - but they are packed full of flavour. A bit like an alpine strawberry crossed with a feijoa (pineapple guava), both tart and sweet and distinctly fruity. These plants make an ideal mini hedge for an edible border in an orchard, vegie patch or flower bed, and can be grown in pots, too. I've begun experimenting with taking cuttings for a cheap propagation process. Very drought tolerant, very productive and very hardy as well. A lower growing tree with a weeping habit which produces fruit like the Shepherd variety, but is better suited to cooler climates. It has done very well in our garden, but it suffered in the extreme heat of January 2009, sustaining burns to its young trunk and dropping the young fruit that was developing. Now that we've had a cold and wet winter (2009), it is covered with young growth and looks like it will do very well. Hopefully any fruit will survive the coming summer. A coat of white acrylic paint to the trunk should prevent any more burns. Young trees need protecting from high winds and the sun for the first couple of years, but once it has lots of hard wood it will tolerate just about all conditions. No pests detected, except for sunburn and high wind. Prune it. Check on YouTube for how to prune avocado. One of two that we planted - the other was Brigitte, but the latter carked it, unfortunately. It struggles due to the slight alkalinity of the orchard bed, but I feed it azalea food, some weak vinegar-water solution and sulphate of ammonia at different times of the year to improve its living conditions. The flowers are a delicate pink-white, very pretty. The leaves turn gorgeous golds and reds in autumn, and they are a lovely soft green in spring and summer. The stems are a russet colour. A very attractive plant. It needs a lot of water, which we can't always supply due to the bloody drought and the water restrictions, but it is shaded from the worst of the summer sun by the deciduous trees in the bed. Once I've got a few more things in the garden sorted out, I will obtain more blueberry plants. Our cool to cold winters mean we can grow the high- and moderate-chill varieties, which tend to be sweeter. None, except for alkaline soil tendencies. This tree was the last of our deciduous trees to be planted and the first to produce a crop, taking only one year to come up with some very delicious, sweet and beautiful fruit. A dark brown skin with pink pulp which is very attractive on a platter with some cheese and raisins. Yum!! Curiously, the fruit ripen only one or two at a time, so we can't have a good feed of figs for ourselves and any visitors at the same time. [Sorry, visitors!]. I'd like a second fig, but we don't yet have the room for one. The site of the intended third orchard bed requires a lot of re-development (and money, sigh...) before we can get that started. Either another Black Genoa or a Brown Turkey will suit us well. 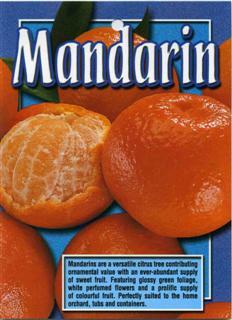 No pests noted, except for birds which attack the fruit, so netting is essential. Variety not known, but the typical one most gardens have in the area. 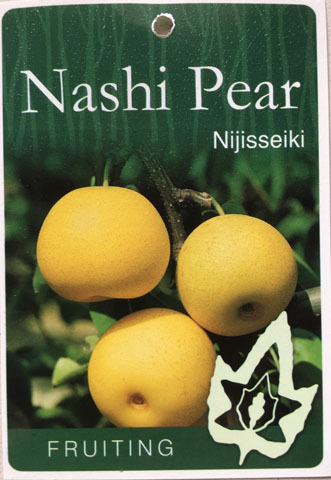 Just one fruit was produced in Autumn 2009, and it was delicious. Very drought tolerant, it has an upright columnar habit with leaves that grow vertically, turning their silvery undersides towards the strongest light to protect itself. The flowers are gorgeous, something like a passionfruit crossed with a fushia, red and cream in colour. We're keeping it at about 2 m high, but they can get to 6 m or so if you let them go. The fruit is ripe when it drops from the tree. The birds haven't discovered the joys of them, thankfully, but the tree is netted anyway. I'm looking forward to a much bigger harvest this coming autumn. Our poor lemon tree is suffering; the second one that we've had. The first one drowned due to planting in too heavy a soil prior to setting up the raised orchard bed. This one grew too well and I didn't notice that the roots were becoming exposed due to the soil sinking as the tree grew. Consequently, the uppermost roots were exposed to the cold and the tree is suffering. Its leaves are yellowing and dropping and it hasn't flowered this winter. I've covered the roots with more compost and given it a bit of a hair cut, plus some boron and Seasol to promote root growth. Hopefully as the weather warms up it will pick up and return to good health. If the worst happens, it will have to come out and be replaced. 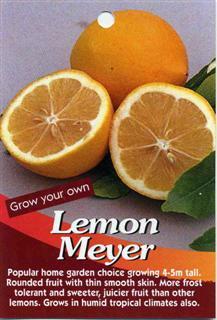 I might try a Lemonade, for the juice and a Lots'a'Lemons in a pot rather than another Meyer in the ground if need be. None required - no citrus gall wasp or scale ever noticed, touchwood. Ruby Ray variety with pink flesh, suited to coolish climates. Like most citrus trees, it suffers in the cold and wind in Victoria, but comes good again in the heat of summer and with the aid of fertilisers and tonics. Seasol and Powerfeed in Spring through to Autumn are important to build up the cell walls so it can better cope with the cold. A dose of Citrus food pellets in February and August, as well as some chelated iron and Epsom Salts (Magnesium sulphate) corrects the winter yellows. Chook poo and human yellow fertiliser (!!) once the leaf colour is back to normal in late spring or early summer makes all the difference. It has tried to fruit a couple of times at least but the foul stinking heat of the 2008/2009 summer, the water restrictions and the hot winds forced it to drop all but one of the fruit that formed. That poor solitary grapefruit is developing nicely now. I can't wait to eat my very own pink grapefruit! No pests affecting it yet, touchwood! It took a while to get going in our rather cool to cold climate and the terrible winds we've experienced in the last couple of years, but it held up very well in the record temperatures of January 2009. It will be providing us with beautifully scented leaves for cooking this year. Little pruning is required, except to occasionally tidy up some leggy growth or re-direct the occasional wayward branch. No pests affecting it, touchwood! Like all of our citrus, it is checked for citrus gall wasp, scale etc but none are bothering it to date. 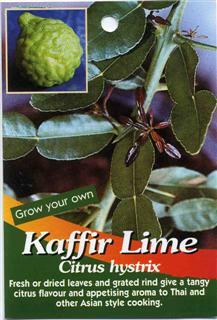 Prone to leaf curling and yellowing in winter due to the cold, but picks up again in spring and summer. Very healthy. Requires next to no pruning, except for removal of the occasional browned off twig. It hasn't fruited yet, but it has tried to. I live in hope that this year it will come to the party. The poor thing struggled in its first couple of years, but is coming along very well now. No sign of flowers in the previous years, but it has been setting itself up and will hopefully fruit this year, 2009/2010. Most of our winds come from the North - hot in summer and cold in winter - and if I build up some shelter then it will never get any sun. I'm thinking some light shadecloth might be the answer as a windbreak. If it doesn't make good progress, I can always plant something else in its place, but hopefully I won't have to do that. No pests annoying it, thankfully.